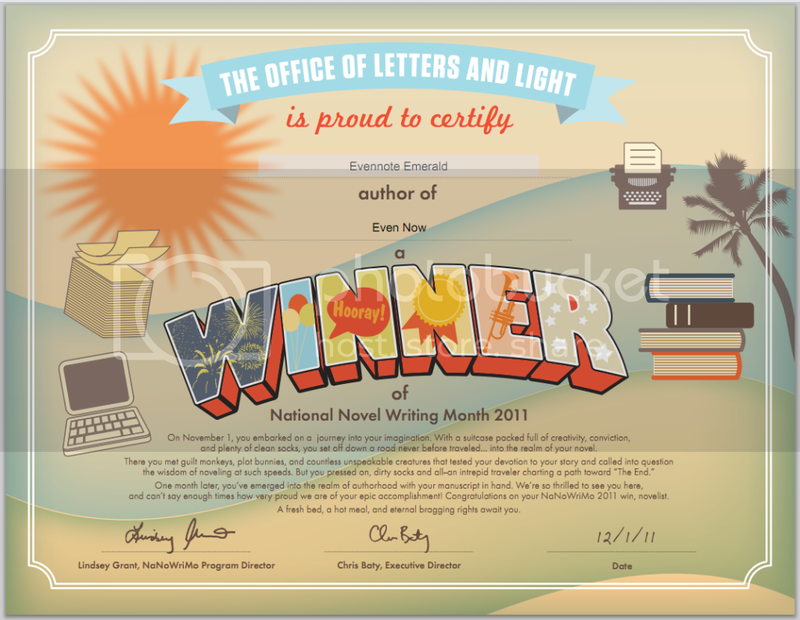 Almost one month, a fair amount of coffee, no noticeable decrease in my playing time save the past three nights, and 60,000+ words later… I FREAKING WON NANOWRIMO! The book itself isn’t NEARLY done yet but as of a few hours ago I had 65,469 words. The goal, in case you’re not familiar with NaNo (National Novel Writing Month), is to write at least 50,000 words between 12:01 am on Nov. 1 and 11:59 pm on Nov. 30. So YAY! Other quick news… Victaurya hit lvl 13 so now she can use a lot of the cool gear I’ve had sitting in her bank for AGES, and Dissy is up to lvl 10. I have a new ranger on Thelanis named Chartreusia (YES, person-who-knows-who-he-is, chartreuse is a REAL DAMN COLOR! Now shup!) and another new Thelanis toon who… is not public yet. Not sure if I’m going to go public with that one or not, might save it for the times I need to kill stuff but stay incognito. Tirae hit lvl 5 and now has FF boots! Ironica also hit lvl 5 and levelled the Sarlona version of Flower Sniffers up to 3 (ooooh!). Also something I need to add to Even’s Guide to PUGging – people who check stats on MyDDO to see if they’ll accept you to their party are morons. Last time I signed Acanthia out, I’d just been vendoring stuff with her so she was wearing her haggle necklace instead of her Shintao Cord, she wasn’t buffed, and she was in wind stance for faster running. So MyDDO showed her at 379 hit points – and when she tried to join an eVoN PUG, the leader declined her because “you don’t have enough hit points.” But buffed, wearing her Shintao and in earth stance, she has 479-499 depending on what else she has equipped. He accepted another monk with 477 and refused to answer when I told him I was at 479 at the very moment he declined me. I sincerely hope Velah ate him for dinner.